My answer is always to start with getting clear on what you want. In this mini-training (10 min., 43 seconds), I share more about why clarity is often overlooked but yet incredibly powerful to gain. Plus, I’ll give you four actions you can take NOW to get clear on what you want in your career. Want to dive deeper? 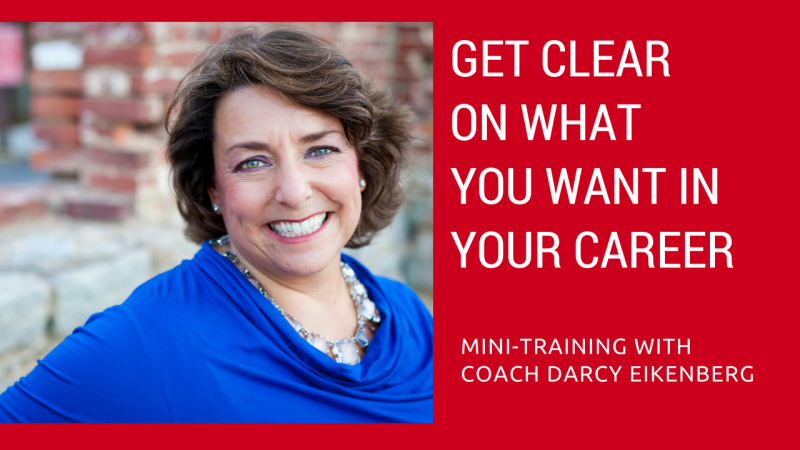 Click here to learn more about my online course, Create Career Clarity, where I share my best tools and proven career advice. The course contains five fast & fun videos, packed with powerful, bite-sized lessons you can apply immediately. Most are less than 15 minutes long. Plus, you’ll get access to my downloadable tools and other helpful resources. And, you have access to the program forever (although I do hope you’ll complete it today! Sign up now to get started. We’ll send you links to all the tools and will guide you all along the way. Plus, you get my money-back guarantee–if you complete all the material in 30 days and still don’t feel your investment has helped you create more clarity in your work and life, I’ll refund your money–100%. Don’t wait–it stinks to stay stuck, and this course is an easy way to move forward, fast. Let’s Create Career Clarity together.